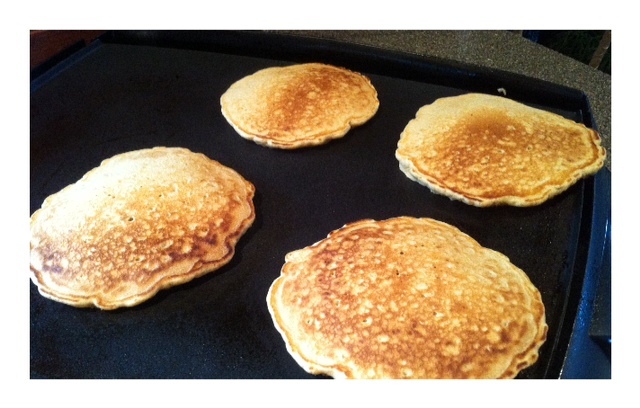 Flapjacks for You… Flapjacks for ME! Our homemade pancakes cookin' up! This new move by some restaurants to post their nutritional information is a great move in the right direction. I’ve read reports that say people are eating 300-600 fewer calories when they’re eating out – AND paying attention to the information provided. That will certainly add up over time – in your favor! Personally I think it should be offered as a courtesy and then the restaurants might try a little harder to make things better for their consumers because I can almost guarantee some of those dishes wouldn’t sell NEARLY as well as they currently do, as people ignorantly gobble up endless calories and FAT. When my husband was in Portland on business, he said that it was a state law that all of the menus had the information. Which, while helpful… also made him feel a little ill about eating out so much. For those of you who travel a lot for business or otherwise, I feel for you – it’s much more difficult to be creative meal after meal on the go. One of the most difficult meals for him was breakfast. He always used to enjoy pancakes on trips such as these… and those meals had 1000-1500 a pop. Whoa. Can you say almost a days worth of calories for someone like me? When we first looked and curbing our intake to be inline with what our bodies were designed to handle, we were shocked at several of the breakfast restaurants information online – pancakes especially … because it almost didn’t seem to matter if you got “plain” pancakes, vs the wheat germ ones… the portions, calories and carbs were just TOO much for one person. Maybe not a big deal once in a while (but you still are going to have to use or burn through those calories SOMETIME so why eat them all at once if they’re going to just turn into FAT?) but if you’re on a vacation, or a business trip… those are REALLY going to add up day after day. (People WONDER why they gain 5-10 pounds on a trip like that?) BINGO! 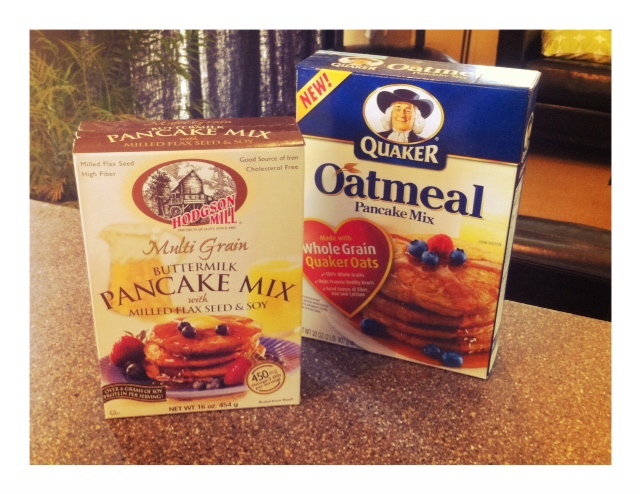 We’ve tried out some healthier pancake options at home… because we LIKE them, and we wanted to see what we could do to improve the option, vs doing away with pancakes altogether! There are two great mixes we’ve used, and we also have a homemade recipe that was modified from a friend that I will soon share. Both are much better options, and still enjoyed very much! That’s the key… we don’t have to STOP eating EVERYTHING we enjoyed… we just need to cut it back, change it up… and make it BETTER for us and our families. A couple of the mixes we enjoy! We have pancakes maybe 1-2 times a month. Posted on October 12, 2011, in Food To Try, Label Reading, Our Struggles, Truth and tagged gestational diabetes, healthy eating, healthy for God, healthy pancake mixes, healthy pancakes, Quaker Oat Pancake Mix, type II diabetes, weight loss, working out, worship in body. Bookmark the permalink. 1 Comment.